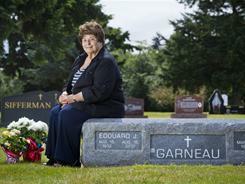 When Edouard Garneau died last August, his wife of 53 years ordered a bench-style tombstone. Arianne Lujon, left, and Lydia Templin test QR codes on signs at J.N. "Ding" Darling National Wildlife Refuge on Sanibel Island, Fla.
Faye Garneau recently added a QR code to the gravestone bench memorializing her husband Ed Garneau at Holyrood Cemetery in Shoreline, Wash. When scanned with a smart phone's QR reader, code on Ed Garneau's tombstone takes users to a web site memorializing him in words and pictures. "I go and talk with him," said Faye Garneau, who admits she isn't so sure she likes that her own name is already inscribed there, too. 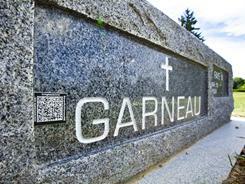 That wasn't all: Several months later, the monument maker added a high-tech innovation - a small, square image known as a quick response or QR code, affixed alongside the big letters spelling out Garneau. The monument maker - a friend - was working on the code before Garneau died of cancer at age 78. People scanning the code with their smartphones are taken to a website that includes Garneau's obituary and a photo gallery highlighting the Seattle-area businessman. They learn he was a collision auto body repair expert, a world traveler and a loving uncle. In the future, more photos and stories from family and friends can be added. "I think it's a neat deal," Faye Garneau said. "It kind of keeps people alive a little longer, down through the generations." The Seattle-based tombstone company is one of many new adopters of quick response or QR codes that also includes, a Florida nature trail and a T-shirt maker. New uses for the technology are popping up almost daily, said Shane Greenstein, a professor at Northwestern University in Evanston, Ill., who studies IT markets. That's because "the bugs are worked out" from the code, which was created in Japan in the early 1990s, Greenstein said, adding that "there's no licensing fee; there are no restrictions. Users are free to think creatively." And, they are. In Seattle, Quiring Monuments has made code-adorned "living headstones" for about two months. It has sold about 30 so far, General Manager Jon Reece said, adding he's gotten "tons" of inquiries, often from people still very much alive: "They say, 'I want my story to be told the way I want it to be told.'" Quiring Monuments offers the QR code, website and website hosting free to people buying new monuments from the company, Reece said, noting the company will add it to existing grave markers for $65. On Sanibel Island, Fla., the J.N. 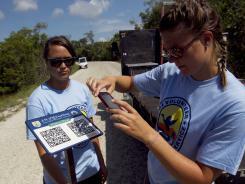 "Ding" Darling National Wildlife Refuge unveiled QR code signs last month along Wildlife Drive, on which nearly 800,000 visitors a year travel by car, foot or bicycle. "It was nice and easy," said 13-year-old Tom Garvey of Delran, N.J., who put his iPhone - an eighth-grade graduation gift — - to use on the trail. The refuge's iNature Trail sports 10 signs, each with two QR codes - one that pulls up videos and educational websites for adults, and another that's tailored to children. "We wanted to find that niche to get kids outdoors and excited about nature," said refuge ranger Toni Westland. The videos feature snippets about ospreys, alligators and other creatures living along the mangrove forest-dotted estuaries of the 6,400-acre refuge. Newspapers, including USA TODAY, use the codes to direct readers to such items as videos and photos. Boulder, Colo., acoustic rock band SoundRabbit sells or hands out T-shirts with codes that take smartphones to free music downloads, said Chris Anton, band member, shirt creator and website design company co-owner. Lafayette, N.J.-based Fuzzy Nation, a designer and wholesaler of gifts for dog lovers, for the first time is putting QR codes on hangtags on its products sold at Macy's department stores nationwide, said Fuzzy Nation owner Jennifer Liu. The scanned code helps people enter a contest that began July 11. The contest promotes pet adoption and will earn one shelter a $10,000 stipend. Organizers of the Chevrolet Fireball Run Adventurally, from Sept. 23 through Oct. 1, say it will be the first national motoring event to use QR codes. For this year's multistate run though the South, competition cars will sport decals with codes. And, driving teams will distribute missing-child posters with codes. The scanned codes aid people with crucial information to share with the National Center for Missing & Exploited Children, said J. Sanchez, event executive producer. Kansas City, Mo.-based mobile tech marketing firm Kickanotch sends code-imprinted frosted graham crackers to new clients as a "thank you" and to take them to a website offering more ideas for the codes, CEO Andy Lynn said. Trinity Baptist Church in Lake Charles, La., is using QR codes in its bulletins and posters to encourage sign-ups for special family and youth programs, said Steven Haney, church media director. Real estate sales agent Marilyn Boudreaux did a double take when spying a code for the first time in the church's bulletin: "I was like, wow - we are with the times." Her discovery occurred shortly after the worship service began. That made the QR code a temptation, Boudreaux said: "I wanted to pull out my phone, and scan it." Contributing: in Fort Myers, Fla.